This October 13, in the year of Our Lord 2014, marks the 97th anniversary of the Miracle of the Sun. This is, of course, that miraculous and mysterious event that was the culmination of the appearances of Our Lady to three shepherd children in a remote and rural area of central Portugal, around the village bearing the name of a Moorish princess, "Fatima." The name itself is prophetic of the wondrous visitor from heaven who would reveal herself there in that mystical year of 1917. It means, "one who weans an infant," or "one who abstains" -- appellations particularly appropriate to the Blessed Virgin we venerate as the Mother of God; she who nursed the infant Jesus and who, in her own right, was conceived without sin and abstained from the ways of sinful men and women so as to be assumed directly into heaven at the time of her death. Like the Miracle of the Sun itself, these are things no longer widely believed in the cynical world we live in, but in these days of 1917, and in the hearts of these children, it was knowledge that filled their young hearts as naturally as the fresh air of the rocky hills filled their lungs. It is the answer to one question commonly posed concerning all of this, "Why them?" The astronomer Carl Sagan dismissed the idea of an active space alien presence on earth by stating to the effect that if such contact was to take place, surely it would be made to those in the scientific community most appreciative of it. In like fashion, there have been the churchmen and those educated in the faith who have also pondered why it is, if the Blessed Mother is appearing at all, that she chooses to reveal herself to children and those ignorant of any formal training in religion. As someone who abandoned his own formal training in religion, and did so when his soul was saved one warm spring night by an undeniably supernatural revelation of Jesus Christ, the answer is obvious. The Blessed Mother's reasons for appearing to us are to convey a message that desperately needs to be heard, not to submit herself to scientific inquiry, or religious inquisition, so as to be tested and declared "authentic" by "experts." To the contrary, her point in appearing is to test us and find out who we are, as it is we mortals who have been weighed in the balances and found wanting -- not her. There is a reason why the Lord tells us in Matthew 18:3, "Truly, I say to you, unless you turn and become like children, you will never enter the kingdom of heaven." It is the same reason the Blessed Mother chooses, as her confidants on earth, children or those of such childlike faith: it is because they possess the vision necessary to see an angel and call it an angel; to see the Mother of God and know in the heart first, and then the mind, that it is she. The Portugal that witnessed the Miracle of the Sun was a nation in its darkest hour. The atheistic government of that day, newly entered into the atrocities of World War I, had spawned a nation that was plagued by anarchy, unrest, and chaos. The rise of Freemasonry in Portugal over the previous century had resulted in the Portuguese Revolution of 1910, and the primary target of this revolution was the Catholic Church. War was essentially declared on all things Catholic, and as the churches were pillaged, the convents attacked, and the clergy mistreated, the cries of the faithful were heard in Rome. Pope Saint Pius X stood firmly entrenched against the evils imposed by the Portuguese government, and with the support of the Holy Father, the Portuguese Church was able to retain its faith in spite of the persecution of the faithful and the exile of not only clergy and religious, but bishops as well. Under the guise of separation of church and state: "Masonic impiety took advantage of the disorder to sow irreligion in the masses. Freedom of worship was hindered by numerous restrictions, the carrying out of apostolic works became almost impossible. The religious orders were suppressed or paralyzed. Moreover, little by little the seminaries emptied, and the clergy, impoverished and chained by restrictive laws, became too scarce to maintain a profound religious life. 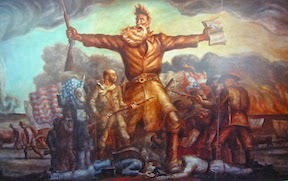 The Catholic press was suffocated, reduced to a few weeklies in the provinces, without serious influence on the masses. The times were evil. The future was even more somber." The faithful who remained turned to heaven and, in the form of a Rosary Crusade, besought the Immaculate Virgin to intercede and save Portugal. This is the answer to another question commonly posed concerning all of this, "Why there?" The winter passed and the spring of 1917 found all of Europe ravaged by the Great War. In Russia, the February Revolution had brought down the reign of the tsarist monarchy, and Lenin and the Bolsheviks were making preparations for the October Revolution that would bring the Communists to power and form the Soviet Union. In Portugal, the atrocities visited upon the Catholic community continued, but a relative peace prevailed in the pastoral, rocky hills around Fatima. 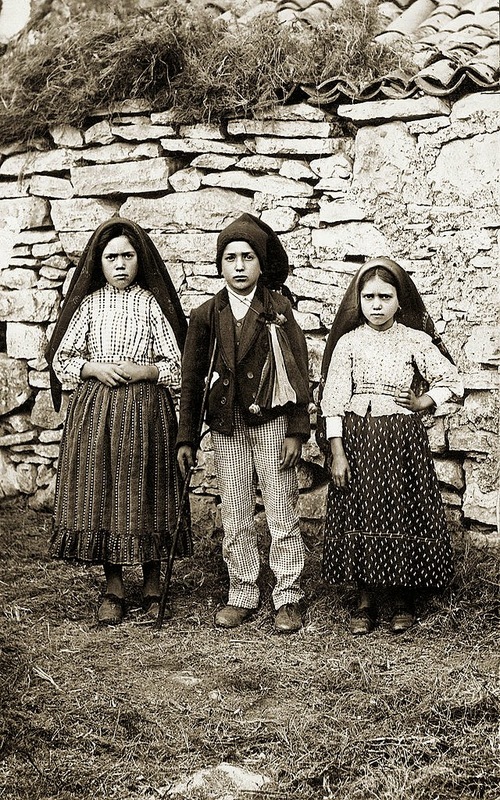 On May the 13th of 1917, the three children left Aljustrel, a hamlet of whitewashed houses on the dusty road to Fatima, and proceeded with their flock to the slopes of the Cova de Iria, a kilometer passed the village. They spent the morning playing as the sheep grazed, and at noon ate their lunch and, as was their usual habit, prayed the Rosary. Suddenly a bright light that they would later describe as "lightning in a clear sky" flashed and startled them. Thinking that somehow this meant a storm was coming, they debated taking the sheep home when another such flash of light occurred. This time, on a holm oak on the hillside, they saw "...a lady dressed in white, shining brighter than the sun, giving out rays of clear and intense light, just like a crystal goblet full of pure water when the fiery sun passes through it." The Lady told the children to have no fear and, after telling them she came from heaven, told them that she would appear to them at this same place and at the same hour on the 13th day of each of the next five months. The Lady asked them, "Will you offer yourselves to God, and bear all the sufferings He sends you? In atonement for all the sins that offend Him? And for the conversion of sinners?" After they answered in the affirmative, she told them, "Then you will have a great deal to suffer, but the grace of God will be with you and will strengthen you." Her final instruction on that day was to "Say the Rosary every day, to bring peace to the world and an end to the war." True to her word, the Lady appeared each month at the appointed time -- or as closely as possible. With each passing month the difficulties the children encountered because of the apparitions seemed to multiply. Overcome by the joy of it all, seven year old Jacinta disregarded Lucia's warning and told the story of the encounter with the Lady to her mother. Soon all three children were embroiled in controversy and, as the oldest, Lucia was blamed by her mother as being the instigator of what was at best seen as a fraud, and at worst as an outright blasphemy. In June the children were told by the Lady that Jacinta and Francisco would be taken to heaven relatively soon, while Lucia would remain to carry out her further instructions. A small crowd had been present this day and had witnessed the flash of light that brought the Lady, and others reported seeing the sun dim. Some believed, but the families of the children, with the exception of Jacinta and Francisco's father, continued to be alarmed and dismayed, and this was complicated by their parish priest, who suggested the visions might be real but of a demonic origin. Lucia was troubled by the pastor's words concerning the possibility of demonic activity, and at first decided not to go to the Cova for the July 13 encounter. As the time came, however, she reconsidered and was present when the Lady again appeared as she said she would. The July encounter was significant in that it was at this time that the Lady divulged the famed "three secrets." She gave the three children a disturbing vision of sinners in hell, and told them that to save these souls God wanted to establish a worldwide devotion to her Immaculate Heart. She predicted the onset of "another and more terrible war" (World War II) that would be the result of humanity's continued offending of God. "To prevent this, I shall come to the world to ask that Russia be consecrated to my Immaculate Heart, and I shall ask that on the First Saturday of every month Communions of reparation be made in atonement for the sins of the world. If my wishes are fulfilled, Russia will be converted and there will be peace; if not, then Russia will spread her errors throughout the world, bringing new wars and persecution of the Church; the good will be martyred and the Holy Father will have much to suffer; certain nations will be annihilated. But in the end my Immaculate Heart will triumph. The Holy Father will consecrate Russia to me, and she will be converted, and the world will enjoy a period of peace. 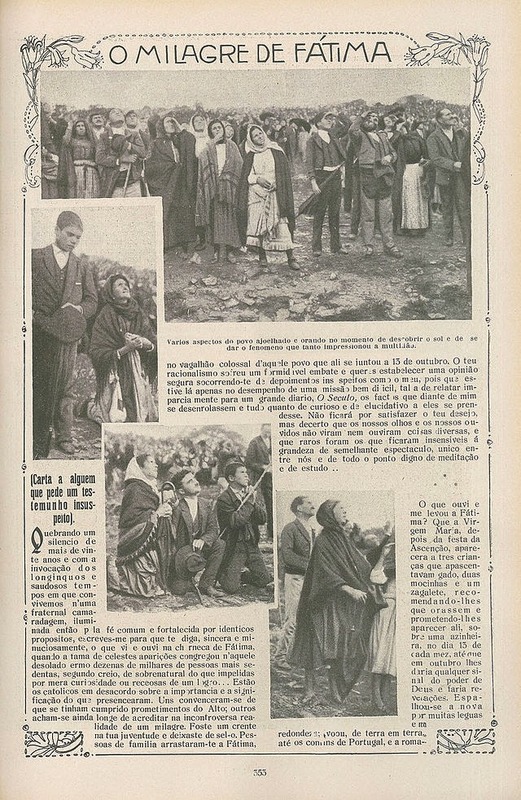 In Portugal the faith will always be preserved..."
In August the controversy surrounding the appearances of the Lady came to a head, as Artur Santos, an apostate Catholic turned high Mason and mayor of the district in which Fatima was located, decided to put an end to the nonsense concerning the visions by taking the three children into custody on the appointed day of August 13. For two days, the children were mercilessly interrogated, bribed, threatened with death by boiling in oil, and locked in a cell with other criminals in order to get them to recant and admit that the appearances of the Lady were a hoax. Despite their ages, ranging from 7 to 10, the faith and courage of the children outlasted the cruelty of the mayor, and they were released on the 15th. The Lady's appearance finally occurred when conditions were right for the three children to encounter her on the 19th of August. The children were instructed to continue praying the Rosary every day and to return to the Cova de Iria on the 13th of the next month. It was at this time that she also told them that on the 13th of the last month, October, she would "perform a miracle so that all may believe." By September 13, the interest in the visions was such that 30,000 people gathered at the Cova de Iria at the appointed time of the apparition. Whether drawn by faith or curiosity, the crowd present was a harbinger of the gathering that would take place in the next month, when the Lady had promised the miracle "so that all may believe." On this day, she told the children to continue to pray the Rosary, and that "In October Our Lord will come, as well as Our Lady of Sorrows and Our Lady of Mt. Carmel. Saint Joseph will appear with the Child Jesus to bless the world." The story of what happened on October the 13th has been the subject of much awe and wonder, doubt and controversy, speculation and theorizing from that day to this. It has been labeled as everything from a satanic hoax to a UFO event, though the Catholic Church has ruled the message of Fatima, and the events that took place there, as "worthy of belief" according to what they were understood to be by the seers themselves -- the supernatural intervention of the Mother of God in human affairs. As the sun reached its zenith in the sky that day, something extraordinary happened. Through a steady rain the night before and into the morning hours, a vast crowd estimated at 70,000 souls had gathered to see -- or not see -- the purported miracle that was about to occur. To say the least, no one could claim to be disappointed by what happened. The rain stopped and, suddenly, as if torn asunder, the clouds parted to reveal the sun. It was not the normal sun, but a whirling disk of pearlescent silver, and it could be looked upon without difficulty, causing some present to believe that it was some sort of an eclipse that was taking place. The sun whirled madly and began throwing off rays of different colors; some say purple, others scarlet, and then a yellow that colored everything upon the ground and gave the onlookers a jaundiced effect. As suddenly as it had started, the sun then stopped whirling and began dancing wildly in the sky before seemingly detaching itself from the heavens and plunging towards earth as a wheel of fire. The spectators reacted in terror; some shouting, some praying, most hitting their knees as cries for God's mercy arose from the crowd, and the general impression was one of impending doom and destruction. The sun stopped short of crashing into the crowd, and then seemed to rise and return to its normal place in the sky. As the crowd stood and cheered, and joined in thanksgiving and praise to Our Lady, it was noticed that those who had been soaked by the rain (as well as the muddy countryside around them), were now dry as if no rain had fallen, and the day continued from this point forward to be clear and pleasant. While the crowd gathered to witness this strange occurrence had waited impatiently for something to happen, the Lady had made her promised appearance to the children. As usual, it was Lucia who spoke to her and asked. "What do you want of me?" the Lady replied, "I want a chapel built here in my honor. I want you to continue saying the Rosary every day. The war will end soon, and the soldiers will return to their homes." Lucia agreed and then asked the Lady, "Will you tell me your name?" She answered, "I am the Lady of the Rosary." Perhaps the greater question is that of why this controversy still remains. The promise and purpose of the consecration of Russia was to usher in a period of world peace that would allow for the further conversion and reconversion of the world to Christ. Though the world has been far from a peaceful place in the nearly seven decades since the horrors of the Second Great War ended with the atomic conflagration at Hiroshima and Nagasaki, neither has the greater conflict resulting in nuclear holocaust that this seemed to portend been visited upon us. In retrospect, it is hard to imagine a political scenario more conducive to the apocalypse foretold in Scripture than the rise of Adolph Hitler and the Nazis in Germany during the 1930's, while the Dust Bowl in the United States, and the ensuing plague of locusts, seemed to cast the pall of Old Testament Egypt into the realm of modern times. And yet the world has persevered. Rather than bemoaning that the millennial reign kind of peace expected by many Protestants has never occurred, we should instead be grateful to God and Our Lady for this imperfect time of peace -- the promised Pax Maria -- that has allowed us the opportunity to pursue the will of God among the nations of the earth. That we have failed to reach the potential inherent in this ensuing time of peace is obvious, and current events may well indicate that this time is now running out. That we have had this time in which the world has been preserved from imminent destruction, and that it is due to the consecration of Russia to Our Lady's Immaculate Heart, as she requested at Fatima, seems equally obvious and the ongoing debate about it moot. Further, it was the Blessed Virgin herself who interceded in the consecration of Russia by John Paul II, when she literally raised him up from his deathbed so as to play the indispensable role that he did in the fall of the evil and godless Soviet regime. The last Soviet leader, Mikhail Gorbachev, announced the dissolution of the Soviet Union on December 8, 1991, on the Solemnity of the Immaculate Conception. He resigned his post on Christmas Day. On January 1, on the Solemnity of Mary the Mother of God, the Soviet Union ceased to exist. Gorbachev would later confess to the Holy Father that he grew up in a home in which an icon of the Blessed Mother was hidden behind the mandatory portrait of Josef Stalin (another candidate for anti-Christ), and that he was secretly baptized by his grandmother as a child. Cardinal Bertone's claims aside, there is reliable evidence that another "section" of the secret does exist. In 1952, Pope Pius XII sent Fr. Joseph Schweigl to interview Lúcia about the Third Secret. Fr. Schweigl reported the following: "I cannot reveal anything of what I learned at Fatima concerning the Third Secret, but I can say that it has two parts: one concerns the Pope; the other logically (although I must say nothing) would have to be the continuation of the words: 'In Portugal, the dogma of the Faith will always be preserved.'" It has also been reported that Cardinal Joseph Ratzinger, when asked if the Third Secret had been revealed in its entirety responded, "Truly, that was not all of it." The first section concerning the pope seems to be the secret as we see it above. As to the remainder, there has been much speculation and many controversial statements made by such "Vatican insiders" as Father Malachi Martin, who claims to have read it. There have also been comments attributed to those such as Cardinal Ciappi, personal theologian to John Paul II, who is quoted as saying, "In the Third Secret it is foretold, among other things, that the great apostasy in the Church will begin at the top." Perhaps more significant, and yet so often and largely overlooked, is Our Lady's promise that, "In Portugal, the dogma of the Faith will always be preserved." And so it has. The global aspects of the meaning of Fatima are well known, but the impact of the apparitions locally are no less astounding or significant. The resurgence in the Catholic Faith that took place in the years after Our Lady appeared resulted in a government cowed into allowing the reemergence of the Catholic Church as the foundation of human life, leading to "...a magnificent Catholic Renaissance." In 1931, this culminated in the bishops of Portugal consecrating the entire nation to the Immaculate Heart of Mary, as 300,000 pilgrim souls stood at Fatima and cheered the event. There followed "... a miracle of political and social reform" resulting in the election of a Catholic president and the rise of a Catholic social order in which "...the laws of government and social institutions harmonize with the law of Christ, His Gospel and His Church." There followed a twofold miracle of peace, in which Portugal was spared from the Communist terror of the Spanish Civil War, and was preserved as well from the devastation the balance of Europe incurred in World War II. When Communists came to power in Portugal in 1974, a Rosary Crusade again delivered the nation from the oppression of the godless. To this day, Our Lady's promise to Portugal remains fulfilled. When Portugal herself was in similar circumstances a century ago, the solution for the Catholic population was found in a Rosary Crusade and in beseeching the Blessed Virgin to intercede and save their country. And in the most unimaginable, illogical, unexpected and yet totally direct way, she did exactly that. And from that time to this, whenever Portugal has sought to backslide into the ways of the godless and the heathen, she has reasserted herself and the true faith of Jesus Christ has prevailed. Our need in America is just as great as in Portugal in 1917. The Holy Father has consecrated our land and the world to the Immaculate Heart of Mary, and we are desperate to respond with a Rosary Crusade and so beseech our patroness of the Americas, Our Lady of Guadalupe, and she of the United States, the Immaculate Conception, to likewise come to our aid. As faithful Catholics, it is contingent upon us to respond in this way, as God would have us do, and it needs to begin here and now; without further delay. We must have the faith to believe that if we call upon her, she will come. We must know in our hearts that she will perform a miracle so that all may believe, and it will lead to a miracle of social and political reform. In this time in which our nation has strayed so far from God, and is engaged in such great sin and global conflict, we need just such a miracle. And so, if we truly want to save America, we must pray together now the prayer of the Angel of Peace, "My God, I believe, I adore, I hope, and I love You. I ask pardon for those who do not believe, do not adore, do not hope, and do not love You." If we pray in this way, then perhaps the hearts of Jesus and Mary will listen. And those who are the godly and faithful ones among our children will see lightning flashes in a clear sky.